Turnbull still killing the ultimate political gift for the Coalition — the carbon tax. There is a Coalition Partyroom meeting coming today where a Turnbull-with-falling-popularity will try to convince a nervous set of MP’s that they won’t lose their seats if the Coalition runs the same soulless campaign it almost lost on last time. Back then Turnbull took 90 seats and turned them into 76 and barely got elected. The biggest obvious and easy win for conservatives in 2019 is to copy Abbott-Trump-Dean proven successes, axe the tax, Get Out of Paris, and run an Electro-Scary-Bill campaign. Turnbull can’t do that because he can’t criticize Labor for a plan he wants to do himself. He can’t call it witchdoctor science, can’t mock them for being tools for the Renewables Industry, can’t ridicule their plan to stop floods with solar panels. Can’t vow to limit renewables damage on electricity bills. Turnbull also can’t brag about his glorious successes either — two previous governments tried their damnedest to bring in an emissions trading scheme and paid for it. Turnbull achieved what they couldn’t but he can’t sing about it. The Green left voters would vote green anyway (too much tax is never enough, and it’s about the tribe not the policy anyhow.) And for the Liberal base it’s electoral poison. A million Defcons are still ready to swing. The Liberals could romp it in in this election if they just dumped Turnbull, grew a spine, and copied recent conservative successes all around the world. PS: Congrats and thanks to the volunteer team taking 23 semitrailers of West Australian hay to starving cattle and sheep in the East. A convoy of 23 semi-trailers loaded with hay left Northam on Monday for drought stricken NSW, thanks to efforts by the Christian church-based Rapid Relief Team. RRT, an initiative of the Plymouth Brethren church, purchased more than $660,000 of WA hay which is set to arrive in Condobolin in NSW on Friday after a 3500km trip. The hay is being transported by WA truck drivers, most of whom are volunteering their time for the nine-day round trip. Damian Wild (2018) Why Australia must exit the Paris Climate Agreement, IPA. PDF. 170 comments to Dear Australia, would you rather have $8,500 or a 0.0001C cooler climate for your 130th Birthday? DEFCON means defiant conservatives as opposed to DELCONS, delusional conservatives as coined by Miranda Devine. We are certainly not delusional but are defiant. Chairman Maol must be dethroned for the sake of OZ. And would be replaced by Shortonideas at the next “election”…..no matter who you “vote” for you get the same agenda….that would be the very definition of a conspiracy. Vote for the Minor Parties. Request a postal vote and number every single person, putting the Major Parties ALL LAST. No pressure at the polling booth that way. Well primary voting for both Labor & LNP is in the 30% range, which means that 30% are voting elsewhere. The problem with using past preferencing to come up with a 2PP is that this time will be way different. Voters are actually choosing to decide their own preferences versus doing what the major parties tell them to do. That’s why the 51-49 is rubbish. I can’t resist saying this. Climate change decisions make themselves if you have something a little more dense than air between your ears and are honest. The world needs you in Australia to say no to Paris. In reality it’s really far worse. Dear Australia, would you rather have $8,500 or a THEORETICALLY 0.0001C cooler climate for your 130th Birthday? Not bad for a Chicago community activist! His grasp of economics was actually better than we thought. Asked what he thought of Trump and the American economy – very nicely thank you! after post a billion + profit from strong American sales! for the first profit in several years. What does business need from power – AFFORDABLE, RELIABLE, DISPATCHABLE supply 24/7 and renewables and NOT RELIABLE and NOT DISPATCHABLE! Craig Kelly, MP also this morning – the only dispatchable power currently earmarked is 2,000 MW of Snowy 2 and 400 MW of batteries – BUT Craig that is NOT is not CREATED it is recycled with 10 – 20% efficiency loss. Renewables get 3.6 BILLION a year in subsidies with 10 Billion in the building fund! We need to RENEW CURRENT and ADD new reliable base load power GENERATION! Gas, Coal, Thorium/Nuclear or Hydro. Thorium/Nuclear and Hydro combined would be a good mix and should (but probably won’t) silence the crackpots who think CO2 is warming the world. Hydro in large quantities will require building new dams and storing more water which is highly desirable even without hydro-turbines generating electricity.Would help drought proof Australia and boost ag production. As we sell Coal overseas we will have the money to build the Dams. Why not? Why does Bluescope support the NEG? Australian steel giant BlueScope is turning to solar to help power its Port Kembla Steelworks, signing a 7-year power purchase agreement to take the bulk of the output from the 133MW (AC) Finley Solar Farm to be located 100km west of Albury. BlueScope chief Mark Vasella and BHP Billiton commercial chief Arnoud Balhuizen will warn Coalition MPs against backsliding on the National Energy Guarantee after former prime minister Tony Abbott last week left the door open to crossing the floor on the policy. BHP, which spent $620 million on electricity across Australia last year, will outline detailed modelling that shows the government plan can bring greater reliability to the electricity grid while meeting emission targets. In a concerted move to counter Mr Abbott and other critics, the two executives will be joined by Business Council of Australia chief Jennifer Westacott and Australian Industry Group chief Innes Willox at the meeting of the Coalition backbench committee on energy on Tuesday. The president of BHP’s minerals operation in Australia, Mike Henry, told Fairfax Media the company was backing the policy as the best way to improve reliability and meet emission targets in an affordable way. The tragedy in that is simple and profound. No one recognized just how thoroughly dishonest Obama is even after he gave his entire game away — I’m out to screw you and I’ll slick talk you into liking it. That anyone could call this little thug, “Messiah,” is beyond me. Yet they did. And he is exactly that, a thug. As you do, so you are. And he did what thugs do. He lied, lined his own pockets, undermined those who paid the daily bills for the United States, weakened our defense, and ultimately violated the constitution with is “pen and his phone” and I think no one knows to this date the full extent of the harm he did to the county that gave him citizenship, the right to vote and the right to compete to become president. If I live to be 100 I won’t have time enough to figure out how he bamboozled so many people so thoroughly that they still follow him today. What have we become that we’re now on the verge of civil war in large because of this one man’s legacy of lies and deceit and his choices for secretaries of cabinet positions? And that’s where we are when people are openly calling for violence against the president. Unfortunately Roy, a very convincing summary. The problem is that so many people are drawn to believe output from the media as being reality. They have neither time nor the ability to check and believe whatever is pumped at them and we all end up being manipulated. The Media is all powerful. If I was a sheep rancher I could get rich. They need a continuous supply of wool to pull over everyone’s eyes so they don’t see the secret. Obama was wearing an empty suit. His words were pure BS. Unfortunately behind the scene where he dared not let anyone who was not in on his scheme get a look he was at war with not just his country but the entire industrial world. We succeeded so we must be stealing it from someone else. Remember his statement that if you had a business, you didn’t build it. And there is the jealousy, not even hidden anymore. You have it and I want it and I’m going to figure out how to legally take it so you can’t even complain. We humans on the whole tend to be always driving at 90 miles an hour down a dead end street with a blindfold on. How we have achieved something on the order of hundreds of thousands of years (according to archaeology) of avoiding extinction is nothing short of amazing. I’m glad he is a dysfunctional man who played golf too often and worked in his office not nearly enough. Otherwise it could be much worse. It’s discouraging that when you finally reach the age where you can see and understand politics clearly, you wish you hadn’t bothered about it. Discouraging is an understatement. It’s depressing. The good guys let their guard down for far too long and now there are not enough good guys left to save humanity’s bacon from the fire. My reading of things is that, at least in American, the average man’s mind is on, his next beer, the next game on TV, and his next romp in bed, not on what his government is doing. I hate to be that blunt but just try to hold a reasonable debate about today’s political hot potatoes without ending up in a shouting match or making an enemy of the guy you would like to convince and see what it gets you. But then I think you already know. Some favored ideology holds sway over cold hard facts and rational thinking. I no longer watch or read the news. Well, not strictly true… …I look for information about what has actually been done and the result of what’s been done and then I know what happened. The rest is just hot air. In an hour of some talking head I may get only a few minutes of actual information. News broadcasts are either slanted toward a particular political view — MSNBC vs. Fox News Channel — or they’re slanted toward all the things you never needed to know about like who slept with whom, who shot whom, the weather in so much bloody detail it gets boring…all sensationalism. Useful information has to be squeezed out of all that by patient listening and discarding the sensational and the nonsense. It gets tough to do. The announcement that John Brennan, former CIA head had his security clearance lifted took less than thirty seconds. Then everyone all day and all night had to discuss it over and over and over again. And everyone has their slant toward the favored view of life they have. I miss Walter Cronkite who just read the news and then it was finished and over with and I knew what happened that day. Now we have Maxine Waters, the next best thing to the village idiot looking like a big leader in the party Democrat. She lives in a mansion compared to anything you or I could afford. 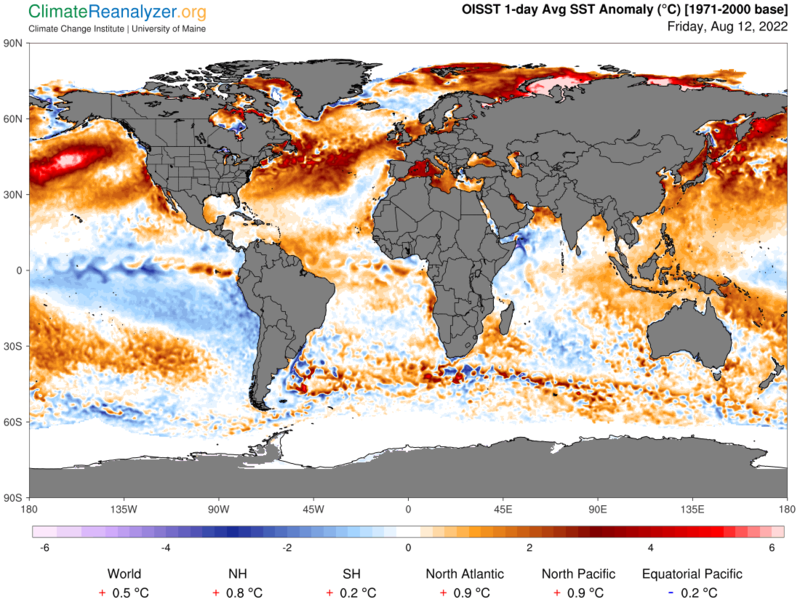 The SST anomaly is based on a 1971-2000 NOAA climatology. Would someone in the LNP please step up and do the right thing by the people that elected you and get rid of the Trojan Turnbull! Today the ginger group make their move. For the love of God, I hope so. But wait, there is more. I’m assuming this is Australia but I can’t get behind the paywall. …and Liddell closes in 4. So only a year of blackouts then. That’s if everything goes smoothly like it always does. Cough cough. I can hear the useful Green idiots gnashing their teeth and getting a head of steam up even now. Pardon the coal pun. He’s telling the truth, for a change. As sock puppets go, he is quite animated…. Good, I want labor to oppose it so ONP and A CP can shut it down in the Senate. Here is the background, a couple of Australian cowboys bought Vale’s Point for a song and now they intend building a Hele. Cool Futures should get behind this push. What’s the voting process today? Does it have to be unanimous for the NEG to be approved? If not then I can’t see it being blocked as I suspect most of the the party is behind the NEG. A leadership challenge won’t work for the same reason. There’s only two things the ginger group can do to block the NEG. One, cross the floor at the parliamentary vote provided ALP doesn’t cross over to the LNP side. The trouble with that is Turnbull will still be PM leading the LNP to a major defeat at the next election. The second option has to be executed. The ginger group resign from the party en mass and block Turnbull or Shorten from running the nation over the cliff. A block of 12 could tell the PM they will cross the floor of parliament and embarrass him. That won’t embarrass him. He would consider that a major victory. He has a tin heart as well as a tin ear. Just takes one to resign and MT has a minority government subject to a no confidence vote. We really need the nationals to stand up and be counted, tell MT the coalition is toast until the NEG is dropped. Not necessarily so. As backbenchers they can cross the floor – Turnbull did that so any objections from him will be ignored. The question is what will the Nationals do? If they vote against it then to get the NEG through (even the lower house) would require Labor to vote in favour of the NEG. That would suit the Nationals as they could campaign on the old slogan “we could keep the bastards honest” and probably pick up several Liberal seats. With Turnbull dependent on Labor support he won’t last. With all the backbenchers thinking about the Longman result (where the Liberal vote dropped below 30%) they won’t be against a change (neither will many Ministers). Would Labor support the NEG? Doubtful if they have ever read Uncle Remus’s tale of the Tar Baby*. Far better to vote against it, claiming it doesn’t go far enough and hope to pick up enough Green support to make up for the loss of old time members, while letting the Liberals convulse. * Immediate death or being torn to pieces by thorns. Sounds reasonable. In that case we can expect after the NEG is approved by the party today the ginger group will cross the floor later this year in the lower house and the NEG is no longer. ALP+Greens still win the next election by a landslide and the nation still goes over the cliff. As I said before the only real option barring an LNP leadership change is for the ginger group to resign from the party at the suitable time to block both Turnbull and Shorten from destroying the nation. It’s really our only hope. I think Turnbull and Frydenberg will let new Hele be built so that the ginger group can come on board the NEG. Haven’t seen the fine print, we should know the answer in a few hours. Too little too late. Shorten will cancel it when he becomes PM. The Liberal/National coalition has a single seat majority. If anyone crosses the floor, the Labor party would say thanks, you no longer have the confidence of Parliament. They would go to the Governor-General and get an immediate change of Government. Then Labor hold an election to cement their electoral position. The first item of business after that would be to vote in legislation to lock in a 50% unreliables “target” with the help of their masters in the Greens party. We can safely say the Westminster system has broken down. No doubt Turnbull would have raised that spectre in the Party Room and the ginger group went to water. Its a sad day for Australian democracy. Turnbull has not just ruined the Liberal Party. He has ruined the country. (Addressing the Rump Parliament. April 1653. Repeated by L.S Amery to Neville Chamberlain in 1940, ushering in the Churchill government. Sounds to me like time it was repeated again in Canberra. Slightly OT but relevant to the stupid politics. It appears that no one in Australia will be safe from snooping on anything they do on line even if it is encrypted. https://www.theregister.co.uk/2018/08/14/oz_encryption_backdoor/ There is a very short window to complain about this and I suspect all comments will be checked and rejected if bad words are used. I think this proves the Turnbull government is out to reduce Australia to a slave state of the UN. Maybe if they could direct us to the period, even the decade, when the climate was somehow less deadly than now? I’d avoid the 1930s, or the 1910s, or the 1950s, or…come to think of it, I’d avoid dialing in the whole of last century. Certainly wouldn’t want a repeat of the century before that. Or the one before that. Or the five before that. Totally don’t want the climate of the 14th century! But here we are chatting away…while Davos Man Turnbull, Davos Thing Frydenberg and Clinton Swampie Bishop are still enjoying power, still aiming to take Australia’s economy to the pub so Labor can then toss it right over the pub counter. Yes indeed, we do but chat in what was lately called our parochial backwater as long as Turnbull, Frydenberg and Bishop are raffling this nation off to the carpetbaggers, touts, stock-jobbers, hustlers, pilferers and cut-purses of globalism. Globalism being a grotesque mix of Trotskyite communism and National Socialism in all its effects…in case some haven’t noticed. Okay? Their names are Turnbull, Frydenberg and Bishop. All will not be well just because they are gone. But all will never be better until they are gone. As I’ve said before, they are the goannas in the chook house and the only place for them is away from the chook house. They will not change. They are goannas. And the names of these goannas who must be removed with the utmost urgency are Turnbull, Frydenberg and Bishop. The subject of their removal is a subject which must not be changed by the usual diverters and distracters. Turnbull, Frydenberg and Bishop. First they go, then we talk. That’s Turnbull, Frydenberg and Bishop. Let’s wait and see if the party has the guts to change leader. I doubt they do but I’d be happy to be proven wrong. Failing that there really is only one thing the so called ginger group can do to stop Turnbull (and Shorten for that matter) running the nation over the cliff. They need to resign and block either Turnbull or Shorten forming a major government. Then we might see something good happen for once although there is no guarantee. One thing is for sure though. As long as the ginger group remain in their respective parties (Liberal/Nats) things will not change and the nation will crash and burn under ALP+Greens. Each family in Australia will be at least $8,566 worse off under the Paris Climate Agreement, on average. This is at a time when wages are stagnating and the cost of living is rising. $52 billion could purchase 22 new hospitals or pay for 20 years’ worth of the Gonski 2.0 education funding. Journalists can’t help themselves can they. They, like the characters in Mosmoso (#6 above)—”Davos Man Turnbull, Davos Thing Frydenberg and Clinton Swampie Bishop”—must always have government make the decisions about personal spending. Families, according to Rachel Baxendale, can continue to lose “at leat $8,566″ annually in order to pay for other government activity. Gonski 2 will achieve what: more zombies among the increasingly non-citizens that Australians have become. As for hospitals? Well, we in South Australia have the new RAH—Rann’s Adelaide Hospital—as the model. Better to shrink government. Oh, and have a meaningful CPI—surely that’s possible? Isn’t it? Paul, I think that the eight and a half thousand is for the twelve years up to 2030 and is per household. I think the Royal Adelaide Hospital project and the State’s power generation (?) system must have been ideas which Mike Rann gleaned from Venezuela. The 100MW Numurkah solar farm might be one of the lucky ones. Located in Shepparton, in a part of Victoria with a relatively strong network, construction on the state’s biggest solar farm to date begins this week and the project owners, Neoen, are confident that no major hurdles will be put in place. But that’s not the case for many other wind and solar projects in Victoria and elsewhere. Some, including those that have gotten as far as signing power purchase agreements, are having to go back to the drawing board because of connection requirements the developers either ignored, or didn’t know about. The issue is most acute in western Victoria, but is also being felt in northern Queensland and south-west NSW. Good news in Reneweconomy!! The tide is turning. Structural geologists dictum – If in doubt, fault it out. Whilst people can argue about what will happen to power prices in the future everyone can feel the pain from rises in the past. Further the 52 billion doesn’t take into account flow on costs to the economy which would be at least as great. The other factor is that Both parties appeared committed to exceeding their Paris agreement targets . Again that would be an additional cost. I think the $ 52 billion will look like chicken feed compared to what will happen if we go down this path. Electricity will be a luxury item. Where does $52billion disappear to? It goes to the undeserving rich. That… and the installation of infrastructure that can never be fully utilized by design. Everything needs to be oversized because it is needed from time to time, either when the wind is blowing and the sun is shining,or when its not. When favourable weather prevails the system has to be big enough to supply the load and charge the batteries. Everything needs to be oversized and under utilized. Its hopeless. Yes, this is my problem with it, I’m an engineer but more than that most of my career has been in asset management, put simply that means to get the lowest cost for the highest output. That is not the cheapest or the most gold plated but rather the most cost effective. RE is an asset managers nightmare, is inefficient, has significant management loses, requires very low utilisation backup. The idea of asset management is to never have anything idle. For example having diesel backed solar is just wasting the capacity of the diesel, you pay the maintenance for the backup generator even though it’s rarely used, that generator is worthless, it’s a nett cost to your business. Besides since the generator can replace the solar, then what’s the point of the solar given the generator is better than the solar. It’s more efficient to just use the generator and dump the solar. Solar and wind are inherently inefficient, it works intermittently so the infrastructure only effectively gets used 20% of the time while fossil generators get used 95% of the time. They use huge tracts of land, and are short lived. They are highly vulnerable to weather events and attack/sabotage. Solar and wind are therefore incredibly wasteful. Sustainable? Not on your life. You’d have to be completely nuts to use them for a national grid, even if just for the fact that they are unable to be militarily defended. Turnbull is not out to win the next election. His one job was to destroy the Liberal party, and fragment their conservative voting base. 10/10 so far. He can now relax, take in the defeat at the next election, and go on to a plum job at the UN, like the dirty little committed Globalist he really is. Then we get Labour, Global migration compact and Paris, very little electricity, lots of tax and lots of poverty. Somewhere the possibility of a revolt. I don’t think the Labor party rejected him at all. I think they saw in him the ultimate Trojan horse and made a sweet deal with him. Run as a Liberal, and wreck the conservatives. It’s been years in the making and finally coming to fruition. Years ago Turnbull said he wanted to get rid of the Country Party (now National Party) and merge Liberal and Labor. Antoine that is a good analysis, but there remains a lot of unknowns. Its more than likely Turnbull will fall on his sword before Xmas if the ginger group don’t get their way. Against the odds the Coalition should then win the next election with a return to the climate wars, in relation to the NEG, and slowing the flow of new immigrants until we unlock the regions. In the 21st century we can overcome the tyranny of distance, but it needs to be done in an orderly fashion to avoid friction. We will decide who comes to this country, not the UN. Mal has already conceded that his use-by date is up and has arranged for AUD 444 M of goodwill to those that will provide him with his next job. And we thought that Julia was the country wrecker without peer! Dumb Energy. Nice book title. Because wind and solar can’t be counted on, the “rest of the grid” has to be able to stand alone. To be clear: if wind and solar vanished overnight, the grid would get along perfectly well. Adding wind and solar to the grid does not replace any significant part of the existing grid because the existing grid must be ready to step in when wind or solar is generating little electricity. The only economic benefit of wind or solar is fuel savings in the backup plants when backup plant electricity is displaced by wind or solar electricity. Media cut-through is a big problem. We need a polemicist of stature who could achieve that.Abbott could do it.First things first; the NEG is to be resisted. THe NEG is a DOG. The RET is the DOBERMAN the NEG is a poor cousin schnauzer! “You have a chance of getting your child back from a rottweiler”. Seems like dogs are being maligned by referring to RET and NEG as dogs. But the primary thing was the control of all communications and media. Its no surprise that the gummint wants all control of media and seems to have implemented the NBN for easier surveillance of everyone. Ignore history at our peril. Neither. I would rather the farmers get the money and more. There’s another aspect of the Paris Accord nobody wants to even mention…the implementation of the carbon tax on petrol & diesel. If this NEG thingy goes thru be prepared for the next shock. The tax on our fuels has no doubt already been engineered with the compliance of the oil companies. It just a matter of springing it on the unsuspecting public. If Turnbull survives this current period the fuel tax will be be implemented. If he loses the next General election the ALP will gladly do it because that’s what Turnbull put in place. The ALP will also happily use the UN construct on immigration to open up our borders once again. That UN agreement had a lot of input from Turnbull! I’ve been saying for the last 2 years not to take your eyes off Turnbull because he really wants to open our borders again. Any more proof required? The fuel tax is a lot closer than you think. Mr Abbott do your job NOW. There’s another aspect of the Paris Accord nobody wants to even mention . . . Try agriculture, for one. That will affect people’s diet, although government may get away with it, particularly if there’s insufficient electricity with which to cook in the early evening. Maybe they’ve got the wrong end of the telescope on agriculture too. Hong Kong is also number three in the world in per capita beef consumption, so their meat isn’t just chicken or seafood. Together with China and Macao, Hong Kong is fourth in the world in per capita pork consumption. If our health authorities are right, then people in Hong Kong should be dropping like flies from heart disease and cancer. Removing transfer payments and the RET are not sufficient to reach the 2007 wholesale electricity price. There is a requirement to remove the priority market access that intermittent generators now enjoy. The key understanding is that there is a cost involved in ramping and shutting down or idling coal generators. That means that the electricity cost will be lower if the intermittent generation is curtailed despite it being supplied at zero marginal cost. Intermittent generation should only be scheduled if it is reducing gas consumption or saving perched water in a hydro system. Renewables do not really have zero marginal cost generation. There is the cost of lubricants, maintenance, land rental etc. Infigen says $24 per MWh. Then there is the capital/loan repayment of around $70 per MWh. All that has to be done is insist that the bid price be a fixed one, and the cheapest bid gets the contract. Much of the time that means coal fired. The ‘duck’s back’ problem will have to be solved by discouraging household solar, but cheaper regular supply will reduce the demand to install, even without the Spanish approach of charging for grid disruption. Quoting the figure per unit of output is misleading. Both the $24/MWh and $72/MWh would be based on potential output meaning unconstrained output. So the actual monthly cost will be say $$9.6M on the basis of potential output of 100,000MWh. If the output is zero then the cost will still be $9.6M. It is a fixed cost, not a marginal cost. If the subsidies ended then the wind generator would need to cover the $2.4M monthly maintenance cost from power produced. With the wholesale price at $60/MWh they could handle quite a deal of curtailment before their maintenance cost exceeded their revenue. Clearly there would be no return on investment but that cost is sunk and would be written off. I got a response from Daniel Wild acknowledging he had not considered the cost implications of priority scheduling. I wonder if there is any economic opportunity for unbuffered wind and solar energy if priority scheduling in removed given that the capital costs are sunk. There is potential to save gas and perched water in hydro system with wind and solar. That may prove economic given that the money has been spent. The question is could the income from wind on economic terms cover their operating and maintenance costs. Insurance has become a large component of operating costs for wind generators. That may prove their early demise. The NEG is deliberately designed to guarantee only two things. One, guarantee power availability, which is good. Two, lower emissions (pointless hence bad). There is nothing in the NEG to guarantee under legislation a reduction in power prices. It’s a hope and a wish. So it’s possible to guarantee the two deliverables of availability and lower emissions by building HELE coal fired power plants. It’s also possible to achieve the same goals with more renewables, close down more coal fired plants and install massive backup batteries for high power availability. The problem with that approach is it would cost hundreds of billions of not trillions due to the cost of the large scale grid battery storage systems (much bigger than the one Tesla installed in SA) that are purchasable on the market. So one path leads to lower prices and the other to much higher prices. Guess which path big business would prefer? The higher cost one of course because it leads to much fatter profits, at least until the nation crashes and burn but like politicians most big businesses don’t look that far to the future and are only interested in short term profits. The media keep referring to the NEG s a trilemma. One Baron Munchhausen comes to mind! Its a clever use of the Helegian dialectic – control both sides of the argument, have total control of the “dilemma” and make sure the outcome is always a UN-designed strait jacket for the population. Not only have we lost generating capacity, but the NEG creates an artificial crisis and the ability to drop it all like a bolt to the head of a steer. The mutant black rhino with three horns…a dangerous set of problems! There is no doubt that the people in the UN who promote Global Warming™ are doing it for malicious reasons, i.e. as a weapon to help destroy Western Civilisation. I wonder however if politicians and bureaucrats in Australia who promote this nonsense are malicious or just plain stupid. I suspect they are malicious because it is so hard to ignore the fact that we are not experiencing anthropogenic global warming and that the hypothesis is null. There are lots of people who believe in even more ridiculous ideas, such as a flat earth. So it’s not beyond the realms of possibility that many sincerely believe in the CAGW story. That does not make them intentionally malicious. They simply do not know any better. They should but they don’t bother to do their own research and instead take the lazy way out and trust what the “experts” say, which is what the vast majority of the public have been doing. However, there are those who know the truth yet deliberately go around peddling the CAGW scam, and they are making big bucks as a result. They are in the minority but they are so powerful they can and do steer weak countries like Australia down the path we are going, and eventually over the cliff to suit their globalist agenda. I guess those electricity price projections for 2050 left this bit out? Thanks for the link about the hay run Jo. My OH heard something on the radio about using the ‘environmental flow’ from the Murray to help farmers to irrigate to get winter-sown crops going but some hard-hearted greenie kook knocked back the idea. Unbelievable. This is an e-mail that I have just sent to my Federal Member, Andrew Wallace. I have let him know that I would also be publishing it on a popular blog. I wonder if he could find it. It has been a while since I last contacted you. of Australia is mind boggling. Australians don’t want higher electricity prices. they have become too expensive (I wonder what caused this?). They don’t want the millions of people who will NOT integrate, EVER. How did we reach the 25 million 20 years before we should have? in CHINA. Does this tell you something? As for Julie Bishop; serving two “countries” (well, the UN might as well be a country). I’ll have a follow-up sometime soon. My end comment, Mal, Julie, Josh and Christopher need to go if Malcolm Turnbulls Liberal Party is to have ANY hope at the next election. Then we can revert to the plain old Liberal Party again. ‘some are much more equal than others. “Jo has been on fire with recent posts”. This post, again, is one that affects everybody. Through all of the very deliberate public discussion that has only one purpose, the average citizen has little understanding of the real issues. The “purpose”, of course, is to confuse the population to the point that they give up trying to understand the relationship between “renewables”, power price manipulation, job losses, fake climate science and manipulative politicians. The heading for this post is enticing, but the actual story that comes out when you read the paper on which it is based suggests that the heading may be open to interpretation. Australia will be 130 years old in 2030. My own birthday of that number will be almost 40 years away, maybe. The eight and a half thousand is per family and is only the cost up to 2030, i.e. Twelve years. The temperature “effect” of 0.0001 C is the Temperature Mitigation IF the IPCCCCC claim of CO2 involvement in Global Warming is true. It is not. Neither human origin CO2 nor natural CO2 can cause Global Warming. I am eagerly awaiting the results of today’s liberal parti meeting. Go T, go Fr, go Bishop. Just Go. BUSINESSES have had enough of this decision that has already cost Australia crucial investment, money and stability. Some of the country’s largest energy users, including BHP, Alcoa, BlueScope and Tomago Aluminium, have released a joint statement calling for parliamentarians both at state and federal level to implement the National Energy Guarantee, “without further delay this week”. ***But a key coalition backbench committee on Monday night reportedly endorsed the government policies by a clear majority, according to Fairfax. The NEG IS A CARBON TAX………..
***theirABC’s idea of a “debate”! (OPENS)JOHN HOWARD, LIBERAL MP: We do need to have an emissions trading system in this country. KEVIN RUDD, LABOR MP: A carbon pollution reduction scheme, is the most effective and least expensive way of acting on climate change…. (ENDS) MARK BUTLER: Well I think, Tony Abbott is playing, frankly a bit of a wrecking role in these negotiations and I think it’s time for Malcolm Turnbull to recognise, that if he’s got any chance of landing an energy policy that has broad political and industry support, he has to stop cow[inaudible] to Tony Abbott and Barnaby Joyce. ****Shireen Khalil must have taken her cue from Leigh Sales, when she called Tony Abbott “Opposition leader” three times in her piece posted in jo’s “Weekend Unthreaded” thread, comment #67). I was about to post that same link when I found yours. I was most impressed with the way Tony A handled the interview with Leigh Sales (who was as belligerent as ever). He remained polite, but refused to allow her to talk him down and finished his answer before answering her interrupting question. The segment starts at 9mins 30 and Tony’s bit at 14mins 46. He nominated two issues which he then addressed. I commend it for everyone. It does not have the support of the poor taxpayers who cannot afford the electricoty prices we currently have ! There will be no new coal-fired power stations built in Australia before 2030, if ever again. Turnbull wont. Shorten obviously not., nor anyone of either stripe to follow. Gaia knows the dollars Australia has given the UN, it could owe us one. There is not one Australian politician alive who has the backbone. I say bring in the Chinese bitcoin miners…..at least they will generate power for us. The good folk of Lesotho and South Africa are already enjoying the benefits of this ‘climate restoration’ as we speak – http://snowreport.co.za/facebook/ – lots of lovely pics of last weekend’s frigid snow blizzard which buried the highveld and passes. We too, in Noddy Zooland, are now being hammered blessed with the frigid snow blizzard – https://www.metservice.com/skifields/whakapapa – which blasted your Australian Alps a mere few days ago. Almost a metre of new snow expected on an already two metre-deep base with -12˚C wind chills… Holocene? Anthropocene? Winter Scene! To counter the Snowy Mountains weather conditions their ABC today published a story about all the hard work behind the scenes using snow making machinery. Yes they are seriously deluded. Um….is there anyone still living in SA? All the farms are being stolen and the economy will collapse in due course….I suspect there are a lot of south africans in WA these days…. is Perth the new Jo-berg? South Africa, or South Australia – it doesn’t seem to matter which one you meant. If a new coal power station were built, I know it won’t, this is just a thought experiment, would electricity prices drop under the current regime? Under that scenario, the prices will not fall unless we scrap the various subsidies and support schemes for renewables to stop any more of them being built. We can build ten coal fired power stations and the prices will not drop if we continue the emissions reduction nonsense. Its over, the cultural Marxists hold sway. So now we have a whole bunch of cowards in the LNP who are now officially become Greenies. The green slime is in every nook and cranny, but Abbott battles on bravely. at 5mins25secs: Daniel Wild on trilemma – Govt, with the NEG, is favouring reliability over emissions reduction by 100 to 1.
didn’t he mean to say: “Govt…is favouring emissions reduction over reliability by 100 to 1″? Now The Institute of Public Affairs has thrown their two cents worth into the debate, saying government needs to dump the NEG immediately. “Implementing the Paris requirements would impose a $52 billion economic hit to our economy,” says Daniel Wild. Michael McLaren also cannot see the merit of the policy. He says it’s hypocritical for Australia to send off our resource abundance for export dollars, whilst simultaneously not encouraging locals to use it here. “If we stopped all emissions tomorrow, Mother Nature wouldn’t know the difference,” he says. Daniel Wild discusses his report which estimates the Paris Agreement emissions targets will impose a $52 billion economic cost. where is the ABC/Fairfax/Guardian coverage? o/t but the other big story of the day provides another opportunity for theirABC to attack President Trump, by cherry-picking the most negative lines from Reuters and AP. note what’s NOT on this ABC page. NOT ONCE IS THE US PRESIDENT CALLED “PRESIDENT TRUMP”. NOT ONCE. $1BN-PLUS OF TAXPAYER MONEY GOES TO THIS OFFENSIVE CORPORATION EVERY SINGLE YEAR AND THERE IS NOTHING WE CAN DO ABOUT IT? C’MON. (ENDS WITH) He (Strzok) repeatedly insisted the texts, including ones in which he called Mr Trump a “disaster” and said “We’ll stop” a Trump candidacy, did not reflect political bias and had not infected his work. An internal Justice Department report issued in June blamed Mr Strzok and Ms Page for creating an appearance of impropriety through their texts but found the outcome of the Clinton investigation was not marred by bias. Ms Clinton was cleared in the probe. Please please please let these wise words be deeply ingrained in every “conservative” mind in Australia as the true received wisdom that will determine the 2019 election outcome. It’s a lot worse than I thought. The NEG will guarantee less not more dispatchable power according to Craig Kelly on 2GB. The NEG is also a mandate under law to meet the Paris targets in reducing our emissions. In other words it’s an official economic suicide note as distinct from an unofficial one. Those who support the NEG in the party room today are nation destroyers. That’s one of the points Tony Abbott quite forcibly on the ABC’s 7:30 report last night. If he really believes all that he has to resign and bring the government to account. I hope he and others do so as a last resort some time in the near future if they fail to remove Turnbull. Otherwise, he and the rest are hypocrites and will allow Shorten to be our next PM, which will of course be terminal. It’s a black day indeed. One day Turnbull and his government will be held to account. Personally I wouldn’t vote thus government if my life depended on it. Any voter who rewarded him last time for backstabbing Abbott is a complete betrayal of everything the Liberals used to represent. A vote for his party next time is even worse. Just don’t vote for either major party – they simply do not deserve to govern the nation under their current leaders. Of course there will be a lot of fools, clueless and brain dead people who will vote for them no matter what so over the cliff we will go. There is a possible way out but time will tell if those few remaining in the LNP who don’t have a death wish for the nation will do the obvious and resign when the time comes. It’s time to smash both major parties and call upon all sensible people who want Australia to avoid a crash and burn to stop voting for LNP, ALP and Greens and vote for the others. Request a postal vote and take the time to number every square, putting all the major parties LAST. No more flip flopping between dumb (coalition) and dumber (alp/greens) !! I have no trouble numbering every square in the voting booth. The trick is to count the number of candidates (usually available in the media days before) then number the worst choice last, the second worst choice next etc. In the case of the Greens whom I always put last, I vote ‘down the list’ i.e. if there are 54 standing the head of the Greens list will be 54, their second nutter 53, then their next 52 etc. This makes absolutely sure that they never benefit. When it comes to the politics of energy, the interests of the United States and European green ideology are irreconcilable. The Trump administration should now formalize its ties with other energy-realistic nations and show the world the benefits of America’s energy exceptionalism—jobs at home, booming exports, and an escape from dismal energy policies predicated on bogus resource shortages. Having broken the spell, America and its friends around the world can reap the benefits. 7 Aug: EcoBusiness: Jay Li: Will today’s solar panels last 25 years? Firefighters were called to a small village in the Netherlands on Aug. 3 after smoke had been detected on a roof. Heat from the sun’s rays likely “overloaded” the solar panels, causing “enormous” damage, according (LINK) to a local news report. Nobody was injured. Scheuten allegedly knew about the fire risk as far back as 2010, De Volkskrant said, quoting company documents, but only began taking action last year after two fires broke out in France. Based in the southeastern city of Venlo, Scheuten Solar Systems went bankrupt last year and since then at least 1,000 damage claims have been lodged with the company’s receiver, the paper said. The following is a summary by the NCPA of Todd Woody’s “Solar Industry Anxious over Defective Panels,” from the New York Times, May 28, 2013. The $77 billion solar industry is facing a quality crisis just as solar panels are on the verge of widespread adoption, says the New York Times. All solar panels degrade and gradually generate less electricity over time. •But a review of 30,000 installations in Europe by the German solar monitoring firm Meteocontrol found 80 percent were underperforming. •Testing of six manufacturers’ solar panels at two Spanish power plants by Enertis Solar in 2010 found defect rates as high as 34.5 percent. •First Solar, one of the United States’ biggest manufacturers, has set aside $271.2 million to cover the costs of replacing defective modules it made in 2008 and 2009. Jo, I found an image recently (see Exhibit 5, p 15 in this report , which shows the relative cost / tonne of CO2 emissions avoided for a variety of mitigation methods. The interesting thing is that the methods on the left (below the line) are simple, low cost ones such as improving machine and lighting efficiency that have a net negative cost – i.e. over the long term it pays the economy to implement them, whereas those on the right (above the line) are complex and costly ones such as wind power, biomass, bio-diesel and CCs which have a net positive cost (over the long term it costs the economy to implement them). I think that it demonstrates that Tony Abbott was on the right track with his ‘lowest cost abatement’ policy of a few years ago which clearly focused on the LHS of this chart, whereas both the ALP and Turnbull’s approach is clearly focused on the RHS. Simply, if we can avoid say 1 million tonnes of CO2 per year for a net saving to the economy of up to $170/tonne (+$170 million p.a. ), why would we even consider a policy that costs the economy up to $40/tonne (-$40 million p.a)? SAN FRANCISCO – Consumers have filed a class-action lawsuit against manufacturing companies over allegations they failed to disclose purported defects in Sanyo solar photovoltaic panels. Myra Dickert and Howard Dickert, on behalf of themselves and all others similarly situated, filed a complaint on Aug. 2 in the U.S. District Court for the Northern District of California against Sanyo Energy (U.S.A.) Corp., Sanyo North America Corp., Panasonic Corp. of North America and Does 1-20 citing allege violation of the Magnuson-Moss Warranty Act and Song-Beverly Consumer Warranty Act. According to the complaint, the plaintiffs purchased defendants’ solar photovoltaic panel models and allege the products are defective as the panels progressively lose actual power output and to fail, resulting in power output degradation. The plaintiffs request a trial by jury and seek compensatory damages, injunction relief, costs, attorneys’ fees, and for such further legal or equitable relief as the court may deem appropriate. They are represented by David M. Birka-White and Steven T. Knuppel of Birka-White Law Offices in Danville, California; John D. Green of Farella Braun & Martel LLP in San Francisco; and Charles E. Schaffer of Levin, Sedran & Berman in Philadelphia, Pennsylvania. U.S. District Court for the Northern District of California case number 5:18-cv-04664-NC. Image 1 of 7: A roof-top solar panel array caught fire Thursday evening in southern Danbury, sending plumes of thick black smoke into the air that were visible for miles. But property manager Stuart Longman suggested high winds during storms this week could have damaged one of the 3,500 individual panels on top of 100,000-square-foot warehouse. Danbury Fire’s new drone helped knock the fire down quickly, Gagliardo added. The drone hovered above the building to give firefighters a better view and its thermal imaging camera helped contain the fire faster, he said. Some of the panels on the roof at 2 Great Pasture date back nearly a decade to when Longman received a $2.6 million federal stimulus grant to continue installing solar panels on buildings around the area. That predates newer requirements that prevent arcing and require a system to shut down instantly if one is detected, said Dwayne Escola, a partner in the Ridgefield-based Northeast Smart Energy. PM Malcolm Turnbull said it meant the nation was “one step closer to ***cheaper and more reliable energy”. He (Abbott) and three colleagues — Andrew Hastie, George Christensen and Eric Abetz — have reserved their position on the legislation, meaning they could cross the floor to vote against it. After the meeting, Mr Abbott issued a statement that said most of the explanations of how the NEG “might theoretically get prices down” sounded “like merchant bankers’ gobbledegook”. He acknowledged that there was support for the plan but said much of it was conditional. “Yes there were lots of pleas for unity, but as one MP said: ‘We’ve got to be loyal to our electorates and to party members too and not show the unity of lemmings.’,” Mr Abbott said. He said at least a dozen members of the Coalition expressed serious concerns about the NEG or the Paris targets, although it is understood the number of dissidents is disputed by others in the party room. Senator Abetz is understood to be concerned that only a two-page document was provided to explain the detail of the way the NEG would work. Liberal backbencher Tony Pasin said he could not support a NEG without a price target. He said the NEG focused on reliability and emissions reduction rather than the cost of electricity. Mr Pasin described the assumptions in the NEG modelling about the price of power falling as “brave” and said he wanted to see a target or Government expectation that prices would fall. Energy Minister Josh Frydenberg said the Government had a “laser-like” focus on ***reducing power bills. Mr Turnbull said the concerns expressed in the party room were about cost and pledged that “everything we are doing is seeking to ***bring down energy prices”. Twenty-six members of the Coalition spoke in favour of the plan during this morning’s meeting and the majority of the Coalition party room has endorsed the plan, although the ABC has been told some did so with misgivings. Mr Turnbull is now pressuring Labor to agree to back the NEG. I heard at least four lower house MPs formally reserve their position on the legislation and at least a dozen express serious concerns about the NEG or about turning the non-binding Paris targets into law with massive penalties attached. They got to be kidding. The LNP want to lock the NEG to the Paris Agreement with massive penalties if we do not comply with the targets? If that’s so the LNP is throwing away our sovereignty to a bunch of foreign anti-Australian UN globalists. Turnbull and his cohorts are selling out Australia. It now makes no difference who is PM, Shorten or Turnbull. LNP is a disgrace. They are turncoats. We have been conned. Those in the LNP who support the NEG are signing the Australian suicide note. Shame on them. They are evil and there is now no way to escape that conclusion. Yeah but what does this mean? “Today Malcolm Turnbull presented an energy plan that will see not a single renewable energy project built for 10 years, will see the rates of rooftop solar on Australian houses halve, and will channel potentially billions of taxpayer dollars into building new coal-fired power stations that the industry itself says are un-investable,” Mr Butler said. Greens leader Richard Di Natale said Mr Butler was right “when he said that this was a dud of a policy”. “We don’t get more renewables in the system, we lock in coal, the targets aren’t based on science,” Senator Di Natale said. the point is this money does nothing , the amount would be acceptable for something worth it. then the amount of money to calculate is the one to achieve the salvation of the holly climate how much it would cost in the world per capita? and then how many capita would i pay forin addtion to my own one? don’t forget it is about redistribution of wealth too. The names of these treasonous politicians must be made public !! Time for the NO CARBON TAX RALLIES TO start again !!!!!!!! We are being sold out buy Turnbull and most of the LNP. There is no other way to look at it. It’s now up to the ALP states to block the NEG and save Australia from the grubby evil hands of the UN. How ironic it would be to see ALP being the good guys in this fight to save Australia. On what model is that 0.0001 C based on? I didnt know they had that sort of (floating point) precision in their super computers the (fake garbage in garbage out) models run on. (SARC). The sheer stupidity of trying to ban “carbon [sic] emissions” (by which gullible people a fooled into believing that carbon dioxide (CO2), a colourless trace gas that we all breathe out and which “greens” the planet because plants love it!) is a pollutant reveals almost incredible stupidity, certainly for anyone who has put in the slightest “homework’ on the climate question. That atmospheric CO2 levels FOLLOW temperature (and NOT the other way around, as promoted by alarmists! ); that it’s impact on the narrow light spectrum is LOGARITHMIC – meaning that any further atmospheric increase effect is TRIVIAL: these two points alone show the sheer stupidity of the “Global Warming/Climate Change” FRAUD! That we now see our electricity system being moved from the World’s cheapest to becoming the World’s dearest – and increasingly unreliable – thereby making the poor suffer and our industries (and jobs) go elsewhere points up the ideological STUPIDITY of those who ‘believe’ in this quasi-religious pseudo-science. All that is being achieved is that the “Gravy Train” rolls on to the benefit of a few charlatans and opportunists! And then there are the gullible politicians who have not, and refuse to, check up on the facts. George Orwell would have loved this when he wrote “1984″! Lots to check out here: http://galileomovement.com.au/media/ShouldYouReallyBeAlarmed.pdf! All life on Earth os CARBON BASED. So they want to ban life! Yep. We know that drill. The GetUppers and luvvies really really want us to stop talking about giving Turnbull the rissole well in advance of that Shorten victory they can almost taste. But I see it’s not working. Lots of references to Turnbull and Frydenberg on this post. You’ll pardon me if I don’t count them all…but it’s good. Keep ‘em coming. We really need to bestow the order of the sandshoe on these globalist white ants. I’m pretty upset but not overly surprised by this. Turnbull, Bishop and Frydenberg…just go, for the sake of this country’s survival in any sort of civilised form. So sorry to bore you GeeAye (not). It’s because science is not the question. Nothing decided at today’s meeting of Turnbull’s Liberals™ was about science. It reminded me of the battles Churchill had to convince his own party that the German Socialist Party were building a huge airfleet for war but in pieces at different locations, that Hitler was a threat. You had Chamberlain trying to appease and even the Royal family thinking they were Germans and not so different. The threat to Australia and our way of life has never been so great and the leader is the pretend conservative Turnbull, who is nothing of the sort. There is no science in man made Global Warming. A vague correlation supported by an allegation disproven by the lack of warming and the complete lack of fossil fuel CO2 in the air, the bunch of lawyers who are in parliament could care less. However we have four or five good people who will cross the floor against the NEG. That’s enough. The only fear is that Bill Shorten will support it as textbook Labour/Green alliance policy anyway. His problem is that his image would suffer, as would Turnbull’s and that would let Abbott in. Turnbull nearly handed him victory on a platter last time. The last thing Shorten wants is to face Abbott. I could not get over how Turnbull sulked after winning the election, would not come out, thanked no one and attacked everyone. Having failed to get his Green alliance, he was really upset at winning. A lot of work to end up having to hide behind Abbott’s policies after all. Now as the man who did nothing, he is trying to bring in his Emissions Trading Scheme for his friends in high places. Strangely, it is probably his handing over of $444million to his friends without request, without tender, without any explanation that will be his undoing, once Shorten gets going. The Turnbull’s have finally shown why they want to get rid of British Royalty. They want to run the place as they choose, their birthright. And that of their friends. The NEG will not get up. Turnbull will lose and resign. He will leave the mess to others. The Liberal and National parties are wrecks. Joyce has crumbled, again. Tunrbull has paved the way to the lodge for Labor, paved in 7 1/2 tons of gold bricks, a true Labor hero. How to stop CO2 production during the solar minimum? Can not. What’s more, this CO2 will cool the troposphere! The rate of 14C production can be modelled  and is between 16,400 and 18,800 atoms 14C m^−2 s^−1, which agrees with the global carbon budget that can be used to backtrack, but attempts to directly measure the production rate in situ were not very successful. Production rates vary because of changes to the cosmic ray flux caused by the heliospheric modulation (solar wind and solar magnetic field), and due to variations in the Earth’s magnetic field. GCR radiation is almost at the level of 2009. Ionization by GCR is rapidly growing from 9 km. More BS from turncoat !!!! turncoat is FOS (Full of S.it) ! I want the names of those who voted for this crap ! That cut may eventually happen but probably not before our power bills have first gone up by more that amount. Abbott and his supporters better think carefully about what they will do over the next few days/weeks/months. If they don’t act seriously on this to stop Australia being bulldozed into a NEG that will destroy this nation they will have just as much blood on their hands as the rest of the mob. Class action against Turnbull when it doesn’t happen? So you have to wonder at the game Turnbull is playing with his signature policy, his first. The other things like the mad gift to friends of $444Million and the $12Billion Snowy II (Abbott’s figure) and the worlds’ most useless diesel submarines($60Billion) and an obsolete NBN ($60Billion) did not require legislation. So what’s he playing at? Any ideas? Or does he already have agreement with Labor? After all, this is classic Labor/Green policy like his removal of Abbott’s Direct Action to be replaced with policy from the Green handbook. So this might be a gift from a Labor/Green PM to the nominal opposition. In fact the only reason they would reject it is that they do not want a nominally conservative PM to take credit, but that may already be decided. Nothing he has done is Conservative. His interpretation of the word Liberal is the same as in Canada and England. Far left of centre. What we used to call Labor. So Malcolm is for all the world trying to gift government to Labor, as he did last time. Everyone else thinks he is trying to win the election. He will not campaign. He may even resign as the last minute. He does not intend to have policies. His tax breaks for big companies is not intended to pass either, just infuriate. Why? He only wants to win on his terms following his Green politics and failing that, he is happy for his British Great Uncle’s Labor party and the Greens to take control. After the last election, Malcolm struck me as the dog that caught the car. Now if he lasts 3 years as Prime Minister, he will have fulfilled his early promise, his destiny. Incredibly rich, admired, successful and an heir to his famous Liberal(UK)/Labor family tradition, except that Labor would not have him. He showed them. Now he can go back to being a banker or travelling first class, feted around the world by friends of the UN/EU in high places. As for the country he wrecked, that is not how he sees it. You should not have elected him in the first place. If they do so again, he would accept, but he would rather leave as looks likely. His Snowy II and his NEG in place, the very Emissions Intensity which cost him the top job in 2009. Plenty to smile about. The Paris Agreement is NOT binding which is why India and China (both signatories) are building hundreds of coal mines to keep cheap and reliable energy for the populations. In a letter (LINK) to Publica, one of the largest pension funds in Switzerland, 166 experts from ETH Zurich, including 128 professors, demanded it stop investing in climate-damaging companies within five years. Publica currently invests around 2% or CHF800 million ($807 million) of the CHF40 billion on its balance sheet in companies operating in the fossil fuel sector, the primary source of CO2 emissions. India has ambitious climate change targets. However, existing inventories of its greenhouse gas (GHG) emissions don’t cover recent years and lack clarity about methodologies and data sources, hampering the design of effective climate policies. “With its pathetic 26 per cent emissions reduction target for electricity and its refusal to develop any policies to reduce emissions in other sectors of the economy, the Turnbull government ***has effectively walked away from the Paris climate change agreement.” – Smart Energy Council chief John Grimes. In the Australian this morning, the number of MPs prepared to cross the floor against the NEG is now ten. Apparently Malcolm Turnbull has had talks with five of these. There is the idea that Malcolm is prepared to consider inclusion of coal as an alternative but as was made clear yesterday by Education Minister Simon Birmingham, this is intentionally misleading waffle. Turnbull is only prepared to talk about ‘dispatchable power’ and according to Birmingham, this explicitly does not include coal. It is double talk or as Tony Abbott says, banker gobbledlygook. What I find unbelievable is that there is no science in this at all. CO2 driven Man made Global Warming is not true as it obvious to Blind Freddy from the last 20 years where CO2 growth is steady and disconnected from temperature. CO2 is not harmful emissions in any sense as CO2 is the essential, critical gas without which life on earth ceases. So the international drive from the UN/EU to eliminate CO2 from the atmosphere is past impossible, past factual, faux facts, faux science made up by bankers, communists(the Greens) and socialists (Communists) masquerading as environmentalism. Well done to those ten who without any deep science knowledge are not convinced by the complete lack of evidence that there is even a problem. Bushfires are caused by forests of flammable (often Australian) trees, not climate change. Droughts are caused by years of not enough rain in dry areas. Floods are caused by too much rain at one time. These are all perfectly natural if not predictable variations. The Great Barrier Reef has been bleached by hot water, not hot air. No one has any idea what to do with $444Million to prevent hot water. That’s possibly $5000 a starfish, again a natural and regular and beneficial predator. As suggested above, you have to wonder if Malcolm Turnbull wants the job. Even very left commentators like Peter Van Onselen are completely puzzled by his complete lack of any agenda. If Turnbull’s signature policies are pumping water uphill at incredible cost, the NBN and handing half a billion to his friends without request or tender, he makes Rudd seems smart and very conservative and he was just as rich. Plus his Chinese was better. While the unprecedented and indefensible and massive gift to the Turnbull’s business mates is not illegal, the private decision to give so much of our public money away with no plan at all is improper and reprehensible. In the scale of a country the size of Australia, it is unprecedented lack of any semblance of propriety, fiscal responsibility and proper procedure. If Shorten cannot move a vote of no confidence in the Prime Minister on this basis and after the defeat of this bill, it would be surprising. At least ten coalition members might agree. If even two coalition MPs agree, say his bff Joyce and one other, Turnbull’s government would fall. As speculated, it may be what he wants, to take his bat and ball and go home. He does not need the money and as polls show, people are starting to see him as another Dudd. Not good for the ego. U.S. Department of Interior Secretary (DOI) Ryan Zinke told Breitbart News Saturday that “environmental terrorist groups” are, in part, responsible for the deadly wildfires in the Western United States. Wildfires have charred hundreds of thousands of acres and caused loss of life, including six firefighters. “We’re spending probably, this season, over $2 billion fighting forest fires when many of them could be prevented by better forest management techniques,” Zinke said. In Australia we even lost a whole suburb in Canberra because of such intransigence and environmental nonsense. There is no Gaia, no Earth mother. There is no man made Climate Change but yes, these are partly man made disasters. Now that we have Prime Minister blaming the current drought on Climate Change which he is going to solve by more fines and carbon credits and legislation. Somehow. Credibility, zero. “Clearly not a lot of joy in either camp. The reason is simple – in my opinion Australia has just been served with a “dog poop yoghurt” energy policy. It goes like this: one side of this debate thinks that the best thing to put in yoghurt is fruit; the other side is of the view that what really needs to be added to yoghurt is a nice bit of dog poo. Now suppose we were to compromise. Suppose the latter faction were to concede sufficient ground to agree that only a tiny quantity of dog poo should go into the mainly fruit-rich yoghurt, would this constitute a victory for commonsense? From what I can see Turnbull is attempting to make Australia the first nation in the world to legislate the Paris Agreement into the local environment, and in addition to include penalties for non-compliance. Together with the other hot issues (agriculture crisis and immigration explosion) his agenda is now clear. He is not only a globalist he is on a mission to surpass Rudd not just because they always were in agreement on climate change and how to deal with it but also to boast on the world stage. These reasons have convinced me that Turnbull is as dangerous as Rudd could ever have been if not more so. Anyone who considers themselves to be a Liberal voter must not vote for the LNP as long as Turnbull is the leader. The problem with that of course is it would allow Shorten to become PM, which is going to happen in any case given the mood of the public. The crash and burn then is accelerated. There is now only two options to save the nation. Either Turnbull is replaced with a new leader who can win the next election to prevent Shorten becoming PM, or if that is not possible those in the LNP who have a brain and a heart to resign from the party and work with the other minor parties to block both Turnbull and Shorten from pursuing their destructive policies. I can’t see any other way to save us from a crash and burn scenario. Tony Abbott was right about Australian border protection, the Carbon Tax and refugees inundating Europe. So why should the Australian electorate listen to him now?